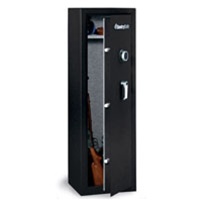 SentrySafe Security Gun Safes: Models with 10, 14 and 24-gun capacity that are either 55” or 59” high. Features include lever handle, concealed hinges and carpeted interior including the gun rack and shelf to protect against scratching. Capacity: 6.2 cu. ft. 0 cu. in. Ship Weight: 129 lb. 58.5 kg.